Much about the Mixteca’s pre-history is unknown, but archaeologists agree there were small farming settlements in the region by 1500 BCE. These communities grew and expanded in number so that by the period 500-750 CE there were socially stratified, urban centers. These early societies developed monumental architecture, a calendar, terrace farming, irrigation systems, and glyphic writing (Bartolomé, 1999; Carrasco, 2001). The 10th century marked the emergence of Mixtec kingdoms, called “señorios” by the Spanish. The señorios were founded on marriage and political alliances which led to the formation of dynasties. Señorios were hierarchical in structure and included classes of greater and lesser nobles, artisans and peasants. 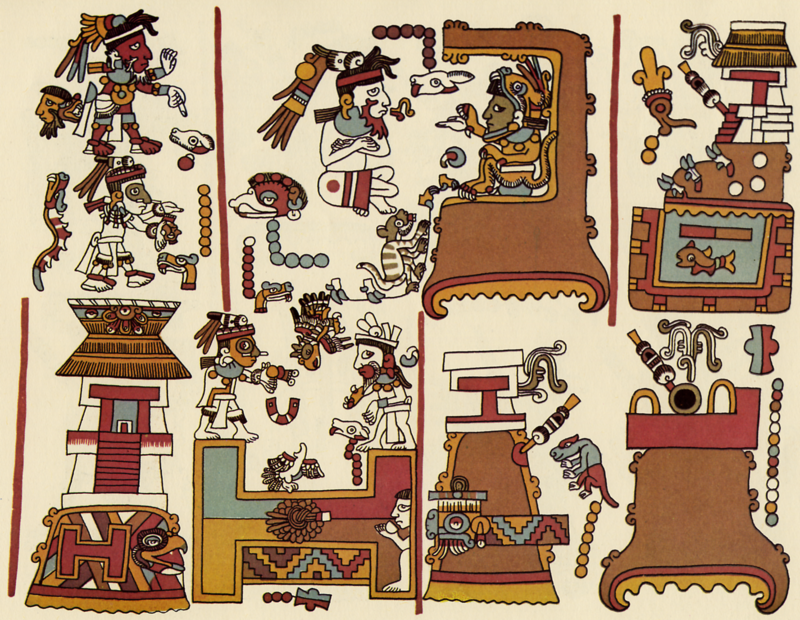 The first reference to Mixtec dynasties appear in the codexes1 from the 10th century. One of the greatest of the Mixtec dynasties was the Tilantongo dynasty, established upon the marriage of two nobles in the holy Mixtec city of Tilantongo in 990CE. The Tilantongo dynasty ruled until the 17th century. One of its most illustrious descendants was 8 Venado, Garra de Jaguar (8 Deer, Jaguar’s Paw, 1053-1115 CE). Several of the codexes tell his story. 8 Venado, Garra de Jaguar became lord of both Tilantongo, in the Mixteca Alta and Tututepec, on the coast, locations separated by a distance of 200 kilometers. He is hailed for having united the entire Mixteca region through battle, alliances and palace intrigues (Bartolomé, 1999). The Mixtecs took over control of the sacred, ceremonial site of Monte Alban, near the present-day city of Oaxaca, from the Zapotecs around 1350 CE. The Zapotecs had ruled Monte Alban for some 10-12 centuries. According to archaeologists, Monte Alban’s Tomb #7, with its lavish burial treasures of gold, silver, pearls and turquoise, is a legacy of the Mixtecs. In the latter half of the 15th century, the Aztecs (more accurately, the Culhua-Mexica), inhabitants of the valley surrounding modern Mexico City, began their conquests of the Oaxacan peoples. Their main interest lay in obliging the Oaxacans to pay tribute; they were not much interested in either occupation or cultural dominance. When the Spanish arrived in 16th century, they found the Mixtec señorios generally intact. The Spanish were very attracted to the region, productive and rich as it was in resources. Spanish clergy and merchants settled in important, existing Mixtec centers. Despite the Iberian dominance, native Mixtec institutions, religious beliefs and practices as well as their language managed to survive alongside those transplanted by the Spanish. 1: The codexes, or “codices,” as they are called in Spanish, are “books” or pictographic writings painted on animal skins or other natural substances (bark, for example) that could serve as pages. A number of Mesoamerican civilizations produced codexes, but after their arrival the Spanish made it a policy to destroy them. There are seven surviving Mixtec codexes: Vindobenensis/Códice de Apoala, Zouche-Nuttall, Bodley, Selden, Rollo Selden, Teozacualco and Nativitas. It is generally agreed that the Mixtec codexes are among the most superb.